Tay-jita Seasoning is an amazing flavored seasoning, PERFECT for Chicken Fajitas! Easy to make. Minus all the un-needed ingredients! Lower in salt than most packets. And, tastier! *Notes: If using Chicken BREASTS: Cook Chicken with the Pepper and Broth Cube (Crushed). Otherwise, ADD Crushed Broth Cube to Seasoning Mix. Add a LIL Water and Chicken into Butter Flavored Cooking Sprayed pan. Sprinkle with crushed Broth Cube and sprinkle of Pepper. Cook til cooked. Remove, shred/cut up, and add back to pan WITH JUICES. Add premixed seasoning. COOK DOWN JUICES. Then, add in Lemon and Lime Juice. Cook a few minutes longer. Add to Tacos with desired Toppings. Photo above is with TACO TAY’S TAYter OLES – Seasoning. AMAZING Marinade complimented with an AMAZING Sauce! You will not regret this Recipe (So, make EXACTLY As-Is). So Tasty, we’re making this AGAIN… TONIGHT! Leftover Meat? We melted Pepper Jack Cheese over top and topped with Sunny Side Up Eggs with Side of Toast and Salsa for Breakfast! Evenly coat Chops with Marinade and Marinade about 5 hours. Mix Tay’s Chimi Sauce Ingredients, set in fridge til use. BEST on Charcoal Grill (Tastes amazing if done right. If it tastes like Smoke… You are NOT doing it right!). Or cook in skillet… Just cook the Meat! Once cooked, allow to set a minute, covered. Thin Slice cooked Meat. Lay flat and top with Shredded Cheese and melt. Add to Buns/Wraps with Toppings of choice. (Some topped with A LITTLE Ketchup on one Bun Slice, then Chimi Sauce on Other Bun Slice. Fresh Tomato Sliced. Red Onion Slices. Some liked it with no Ketchup, just Chimi Sauce). – Also, an Optional Topping: Dried Oregano seasoned Mushrooms sauteed w/ Butter Spray or Extra Virgin Olive Oil. I skipped. LEFTOVERS? Melt Cheese over Meat (I used PepperJack). Top Meat with Sunny Side Up Eggs. Serve with Toast and a lil Salsa on side! (I skipped Chimi Sauce). Skillet Tip: Lightly Oil or Spray pan. Get to a nice heat, to a SIZZLE. Sear Pork on each side about 3-4 minutes, or til done. Allow to set a few minutes. Charcoal Grilling Tip: We build a hill in center of grill. Light charcoal (We use Regular Charcoal for above recipe). Once coals are ashy grey, they are ready. Place on food, on outside of hill of charcoal. Prop Grill Open, using a Slightly crushed pop can. Chicken tip: Lay Chicken on outer part of grill (Outside hill). Once Chicken isn’t sticking to grate, so much, it’s ready to flip. Flip once, that’s it. Cook til Thermometer reads correct temp. AVOID TOO MANY FLIPS. Allow meats to sizzle once it hits grill. Seal that side, flip. Seal other side. Locks in Moisture! Also, Meat cooks as it sits! 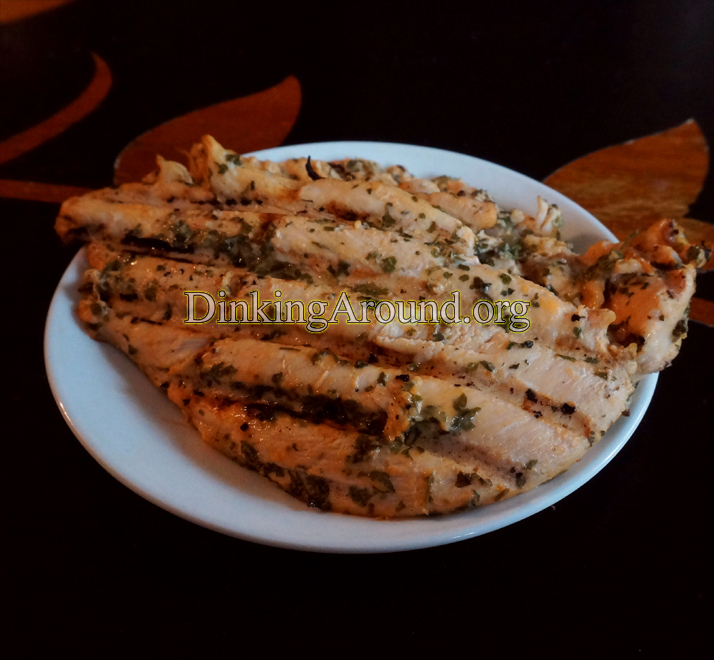 Marinade thawed fresh chicken breasts Up To 5-8 hours. Charcoal Grill is TASTY! Eat alone, on Taco Shells (With Tomatoes and little Mayo), or over Rice (Cooked in Chicken Broth). 1-2 can Chipotle Peppers in Adobo Sauce (Entire can with sauce, mince peppers)- I only use 1 can. Throw chicken, cumin, salt, pepper, peppers, onion in crockpot. I only use 1 can Chipotle Peppers with Adobo, but, you may want one more. Spicier, tho. Cook until chicken is done. Shred chicken. Add back into crock. Mix well. Prepare rice. I microwave in microwave safe bowl with microwave safe lid. I add water to rice (As box suggests). I add the crushed broth, cilantro, and lime. Stir. I cook according to box. But, halfway through I stir, then finish cooking. When done I stir again, taste test, make sure it has nice lime flavor (Offset adobo). If not, add more. Stir, set aside covered a few minutes. 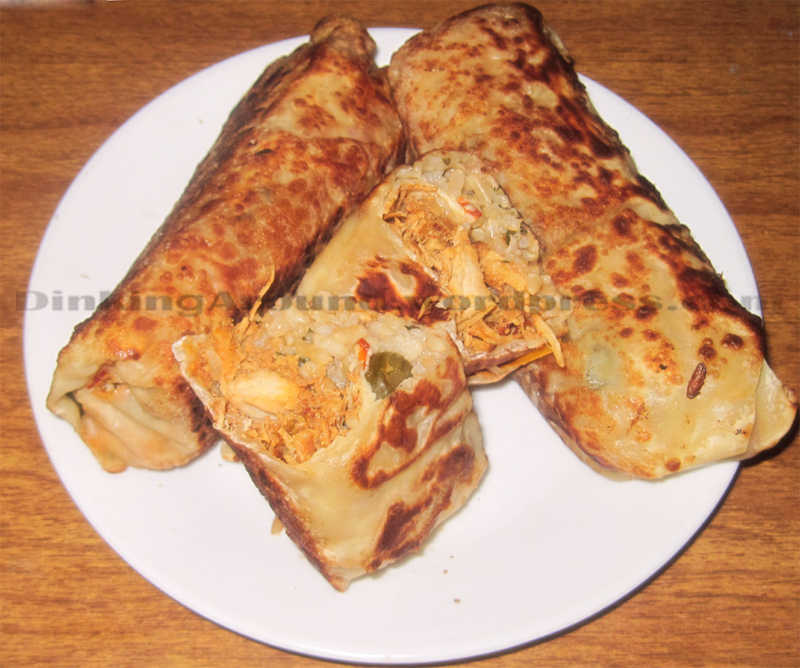 Fill eggrolls with chicken mixture and rice mixture. Top with minced jalapenoes. Wet corners, wrap up. Spray skillet with butter cooking spray. Brown all sides. When done, I always sprinkle lightly with garlic powder. Serve with sour cream.